Mind Tools for Managers helps new and experienced leaders develop the skills they need to be more effective in everything they do. It brings together the 100 most important leadership skills—as voted for by 15,000 managers and professionals worldwide—into a single volume, providing an easy-access solutions manual for people wanting to be the best manager they can be. Each chapter details a related group of skills, providing links to additional resources as needed, plus the tools you need to put ideas into practice. Read beginning-to-end, this guide provides a crash course on the essential skills of any effective manager; used as a reference, its clear organization allows you to find the solution you need quickly and easily. Success in a leadership position comes from results, and results come from the effective coordination of often competing needs: your organization, your client, your team, and your projects. These all demand time, attention, and energy, and keeping everything running smoothly while making the important decisions is a lot to handle. This book shows you how to manage it all, and manage it well, with practical wisdom and expert guidance. Managers wear many hats and often operate under a tremendously diverse set of job duties. Delegation, prioritization, strategy, decision making, communication, problem solving, creativity, time management, project management and stress management are all part of your domain. 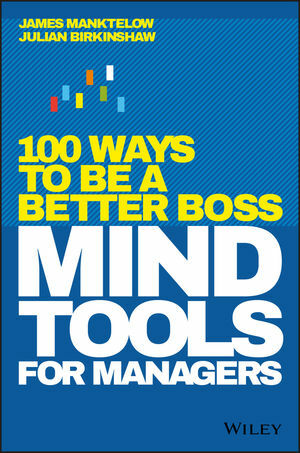 Mind Tools for Managers helps you take control and get the best out of your team, your time, and yourself.